atretic. This results in three great vessels arising from the arch: a right brachiocephalic artery composed of the proximal remnant of the right arch and the right carotid and subclavian arteries; a left common carotid artery, and a left subclavian artery. The remnant of the ductus arteriosus, the ligamentum arte-riosum, connects the bottom of the transverse arch to the proximal left pulmonary artery. 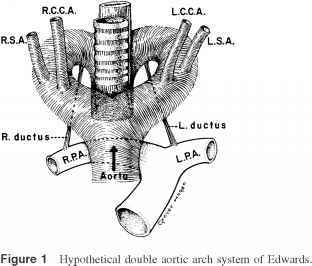 Essentially all of the developmental anomalies of the aortic arch branches can be explained by variations in which part of the embryological double arch becomes atretic. A vascular ring results from encircling of the trachea by a combination of the aorta and its branches and the ligamentum arteriosum. If the ring is tight enough, tracheal compression and respiratory compromise may result. 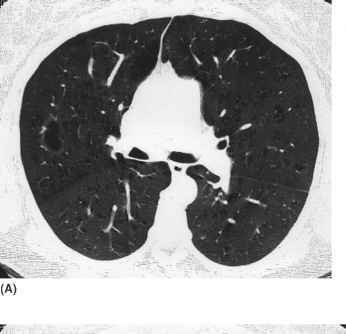 It is important to remember that the mere presence of an arch anomaly does not mean that there is a vascular ring. The diagnosis of ring should be made on the basis of symptoms and anatomy, not anatomy alone. When presented with a patient with stridor, the evaluation should begin with a frontal and lateral chest radiographs and a barium esophagram. If these confirm the presence of airway compromise and suggest a vascular cause, further evaluation with cross-sectional imaging can be pursued. In this day and age, there is little, if any, indication for angiographic evaluation of vascular anomalies. Magnetic resonance imaging (MRI) using spin-echo (black blood) techniques is an elegant method of delineating the mediastinal vascular anatomy in infants, children, and adults with suspected congenital aortic anomalies, particularly vascular rings and aortic coarctation . The lack of need for intravenous contrast and the ability to obtain two- and three-dimensional reformatted images to optimize display of aortic and branch anomalies make MRI the modality of choice in infants and children. Table speed = 15 mm/rot. in the adult population with the following exceptions: in neonates and children a lower exposure technique is utilized to limit radiation dosage, thinner colli-mation (3 mm) is utilized as less cephalocaudal coverage is needed, and the volume and rate of contrast administration is based on patient weight (2 mL of 300 mg% nonionic/kg injected at 2 mL/sec). Scans are reconstructed at overlapping (i.e., 2 mm) intervals for soft-copy interpretation and two- and three-dimensional reconstruction on a workstation.